4 Common Gutter Problems Experienced by Homeowners. As a premier gutter replacement and repair service serving Middle Tennessee, we’ve seen it all. Gutters are a vital part of your home, yet many homeowners neglect the well-being of their gutters and end up causing extensive damage to their home. The purpose of a gutter system is to divert water away from the foundation of your home, therefore actively thwarting any damage. In order to protect the structural integrity of your home, your gutter system must be properly functioning. If you leave it be, you may end up paying for more than just a replacement gutter system! Take a look at some of the most common gutter problems experienced by homeowners. Gutters pulling away from the house. If your gutters seem to be pulling away from your home or sagging, they are old and need to be replaced, or they may simply need new hangers. Although this is an easy repair, your best bet is to call a professional contractor who is comfortable performing the repair. At times, the weight of the gutters may simply be too much for the hangers. 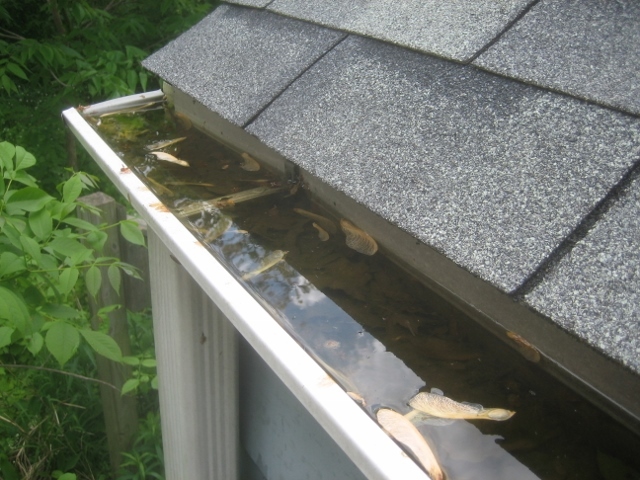 If your gutters are filled with debris and standing water, their weight will increase and cause them to sag or pull away! Another typical problem facing residential gutter system is leaks and holes. Depending on the size of the hole, you may need to seal it with caulk or cover it with a patch. Although it may seem like an easy fix, a professional gutter inspector will know where to look for typical leaks and how to properly take care of the situation. In order for your gutters to properly flow water away from the foundation, they must be properly pitched towards the downspout. The recommended pitch grade is ¼ inch for every 10 feet. The best way to measure the pitch of your gutters is to check for standing water after a rainstorm. If your gutters are perfectly clear and there is still standing water, the pitch is incorrect. Now, these common gutter problems are able to be fixed by residential homeowners. However, if your house is too tall for a ladder, or you do not have experience fixing gutters, we do not recommend that you attempt to fix these situations. By calling an experienced gutter professional, you’ll save money and have peace of mind knowing that your gutters are completely and professionally repaired. If you are experiencing any of these household gutter problems, be sure to call L & L Contractors at (615) 372-4765 for your free gutter consultation.